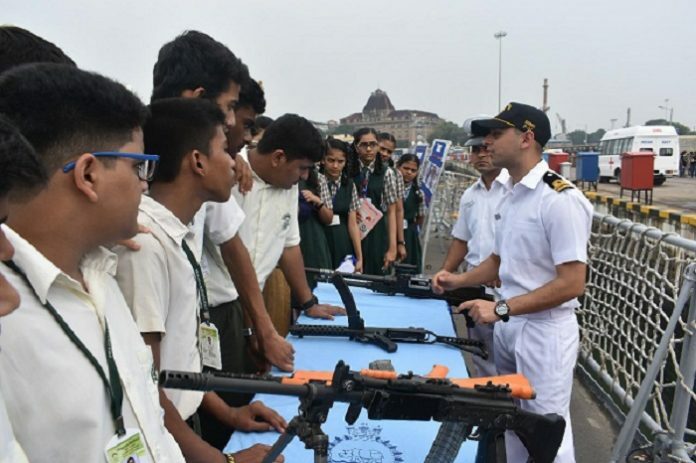 AS part of ‘Parakram Parv’ celebrations to commemorate the second anniversary of surgical Strike by India, almost 6000 school children from about 30 schools in and around Mumbai along with cadets from NCC and Sea Cadets Corps (SCC) visited frontline ships Mumbai and Brahmputra of Western Fleet at Naval Dockyard, Mumbai. The children enthusiastically interacted with naval personnel manning various stalls exhibiting static models of ships/ aircraft/ arms and equipment within the premises of the Naval Dockyard, Mumbai. The young visitors also got a glimpse of various videos on the operations by the Marine Commandos, Surgical strikes of the Indian Army and the numerous operations conducted by the Indian Navy. One of the most popular activity for the school children was to express their gratitude on the numerous graffiti walls of canvas and acknowledge the sacrifices made by the armed forces. The Naval band also enthralled the children and general public at Ballard Pier by honouring the fallen soldiers during the period with their soulful tunes.